Facebook has grown to be a key platform in every marketers strategy due to its adoption around the world. In the 4th quarter of 2017, Facebook had over 2 billion monthly active users and 1.4 billion daily active users (Statista). Facebook advertising can be an effective way of promoting your brand if you know how to get your Facebook audience research right. Although Facebook attracts a lot of users worldwide, finding and targeting the right audience on Facebook can sometimes be onerous. Many online merchants struggle to target the right audience with their products and most often fail to implement successful Facebook advertising strategies. They fail to take advantage of Facebook’s research tools and advanced targeting options in-order to maximize returns. Finding and attracting new customers on Facebook can be done in two ways; using interests ads or look-alike audiences. This guide will cover interest ads, creating ads with look-alike audiences will be covered in another guide. Interest ads are the most common types of ads created on Facebook. Interest ads, like its name suggest are created to target people who follow a particular interest. There are 2 types of interest on Facebook, core interest and pages. example: reading, movies etc. Facebook also puts users into core interest groups based on their usage patterns which includes things they follow and like on Facebook. 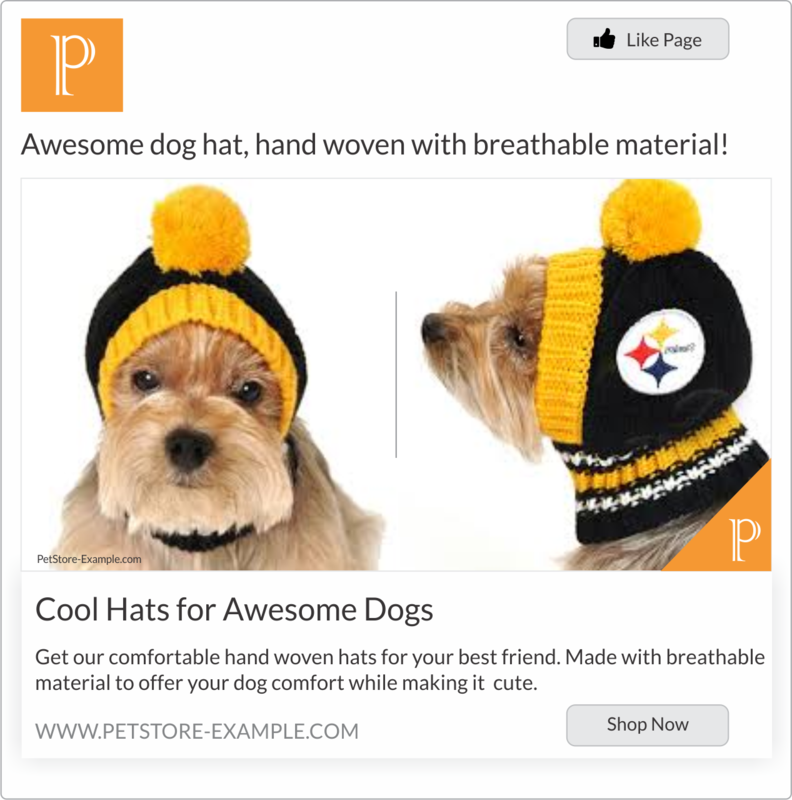 The second type of interests are pages, some pages on Facebook can be targeted as interest in your ad. This is the type of interest we will be focusing on. To find the right pages and target audience you must first perform an audience research. One tool that can help you do that is Facebook audience insights. Facebook audience insights, is a research and discovery tool that allows users to get detailed audience information about specific Facebook interests or custom audiences. Audience insights enable marketers to find key demographics and behaviour patterns about their target customers. Audience insights can help you identify the demographics of a target audience, the top pages they follow, their spending behavior etc. 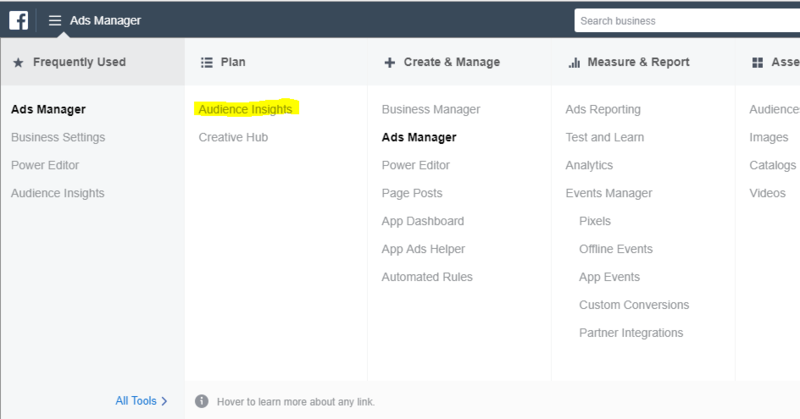 Facebook audience insights is a free tool and can be accessed in your Facebook business manager dashboard. To effectively utilize Facebook audience insights, you must first understand the various parts of the tool. Audience Insights has a left and a top menu. The left menu is where you define your target country, age, gender and other connections such as pages. The advanced menu item offers more options to refine your search. The interest text box is where you input an interest/page or a group of interests in order to get information about them. The top menu immediately shows information about the monthly active people in the target audience/interest. The “Demographics” tab shows information about gender, age distribution, and lifestyle. The “Page Likes” tab shows top pages that the audience follow. The location tab shows the top countries or states where the audience access Facebook from. Within the “Activity” tab you will find information such as the median number of times the audience click on ads within a month and the top devices they use to access Facebook. The “Household” tab shows information about household income and homeownership. The “Purchase” tab shows information about spending behavior of the target audience. These are vital information that can help you define and target the right audience on Facebook. Now that we know the various parts of the audience insights tool, let’s learn how to use it in finding a target audience. Let’s imagine we want to advertise a new dog that we added to an online pet store. We will first have to find our target audience using the Facebook audience insights tool. Follow the steps below to research on your target audience. Always define your advertising goals before you embark on any campaign. This will define your success criteria and help guide your marketing efforts. Target dog lovers and enthusiasts. Run campaign for 21 days. Create a spreadsheet either in excel or google sheets to record certain details about your audience/interest. The sheet should contain the following columns, “Interest Name”, “Monthly active people”, “Audience limit”, “Ad click”, “Purchase”, “Device”, “Type of page”. Here is a link to a sample sheet, make a copy in your Google drive to edit it. Pages are ideal to target with your Facebook ads, because specific pages within a target niche are most often followed by fanatics. Using a page as interest in your ad means you will be targeting all the followers of that page, but bare in mind that not all pages can be targeted. I normally use Google search when finding Facebook pages to target. For this example, I searched “dog accessories” and the first result was PetCo. I clicked through to their website to find out what they do. PetCo is also an online store that sells pet products which means it is a competitor. I found a link to their Facebook page and clicked it to find out if they are active on Facebook. Their page is verified by Facebook and their most recent post was 16 hrs ago as at writing this guide. The post already has 17 shares, 1.4K reactions and comments. This shows that the page is well maintained and the followers are actively engaging on the page. 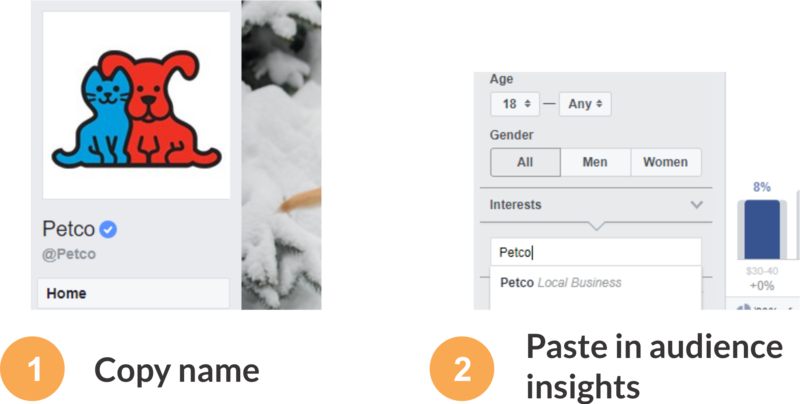 To find out if PetCo’s Facebook page can be targeted, copy the name and paste it in the interest textbox inside audience insights. If a page is targetable audience insights will show you information on that page but if the page is not targetable, audience insights will not show any audience information. You can also use Facebook to find pages. Input the same search query in Facebook and select pages below the search box. You can also check the “verified” box to view only verified pages. From my experience verified pages are more likely to be targetable. After pasting the page in audience insights, select United States as the target country in the left menu. Move over to the top menu, you will find the range of monthly active people. Copy this figure and paste it into your spreadsheet under the “Monthly active people” column, record the upper limit of the range as the audience limit. Now let’s go through each tab. Now click on the “Demographics” tab to find the gender and age distribution of the audience. In this example, it can be seen that women form the majority of the audience with 84% and men with 16%. The age distribution is also clustered around 18 – 54 years.The “Demographics” tab also shows information about lifestyle, relationship status, educational level and job titles.This information will help you define the persona of the audience. Record the top gender of the audience inside your spreadsheet and the age range. In this example, I will select “female” as my top gender and 18 – 54 as my age range. Under the “page likes” you will find information about the top categories that are followed by the audience. Each category may contain multiple or a single Facebook pages. The page likes table shows you pages that are relevant to the audience. One of the most important data in this table is the affinity score. The affinity score tells you how likely the audience will like a given page as compared to everyone on Facebook. The higher the affinity score for a given page, the more likely it is to be liked by the audience. The information found on the “Page Likes” section gives you an overall view of the audience preferences by letting you know what other things they are interested in. The location tab shows you the top cities and countries of the audience. This means that the audience lives or access Facebook from that location. One important information under the location tab is language. This will allow you to know the top language spoken by the audience, hence, informing you about the language to use in your ad copy. The activity tab is one of the most important sources of information in audience insights. Within the activity tab you will find information about the median number of times the audience have clicked on ads within the last 30 days. It also shows the level of engagement of the audience group. With the median number of pages liked, comments, posts liked, posts shared and promotions redeemed you can get an overall view of how the audience may engage with your content. Knowing the top device used by your target audience is vital in reaching them at the cheapest cost. The activity tab will tell you the top device used by the audience and even the top operating system. This information can be used to refine your placement and make your ad effective. Record in the spreadsheet the median number ads clicked and the top device used. For this example, I will record an ad’s clicked value of “44” and a top device of “mobile”. I normally look out for audiences with a median ad clicked not be less than 20. The purchase tab shows information about the spending behavior of the audience. With regards to this example, the key spending behavior to note is pet products. It can be seen that 55% of the selected audience spend on pet products with a compare value of 23%. The compare value is the percentage value of how likely the audience will be in a particular group. The higher this value the better, compare value should not be less than 5%. Remember to record your purchase value in your spreadsheet. Pages of stores and magazines should be considered first because followers of such pages may already have the behavior of buying online. For this example, the page belongs to an online store. After recording the details for a particular interest, go back to the “pages liked” tab and analyze every relevant page there. After exhausting all the relevant pages go back to Google or Facebook and search for more pages. Repeat this process until you have enough pages to use as targeting in your ad. After completing your audience research you can then go ahead and create your ad. There are various targeting techniques that can help you make your ads laser focused. Here is a blog about how to laser target your Facebook ads. If you are interested in learning about search engine optimization (SEO) and Facebook ads then sign up for our blog and get informed about modern marketing tips and techniques.